We had a fantastic time at Destination D! 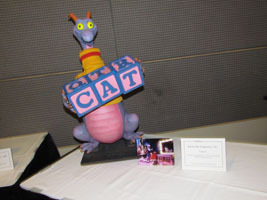 The event was full of wonderful Disney memories, and we made some new ones as well. 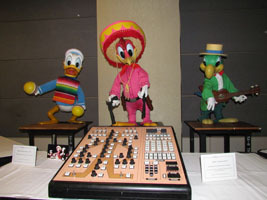 There was even a small Archives area which consisted of characters such as Donald Duck, Panchito and José Carioca from the classic Mickey Mouse Revue (below, left) and Figment from the original Journey into Imagination. (below, right). 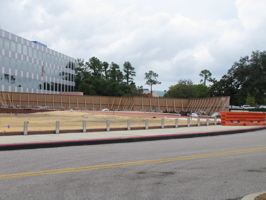 We stopped by the Team Disney building and saw that the reflecting pool is completely drained and work is being done where it once was (below left and right). 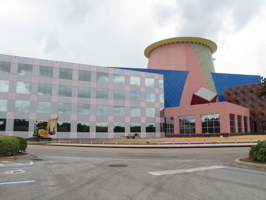 Team Disney is the administrative headquarters of the Walt Disney World Resort. 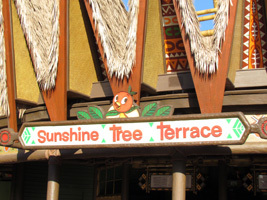 It opened in 1991 and is three times larger than the Team Disney Anaheim building. Orlando, FL. (July 1st, 2010) – To celebrate Independence Day, we are re-releasing the Jeff Lange Remembers: Epcot’s Star Spangled Holiday Spectacular! DVD. Jeff Lange takes you back to July 4th, 1992 for Epcot’s Star Spangled Holiday Spectacular! Just imagine a patriotic version of the Candlelight Processional and you will get an idea of what this special show was all about. Also included is the Epcot 4th of July perimeter fireworks and a special bonus, the 1993 version of The American Adventure. Your Independence Day celebration begins as you enter Epcot Center, admiring Spaceship Earth as it was before the Millennium Celebration enhancements. After making your way to the American Gardens stage, you take your front row seat for Epcots Star Spangled Holiday Spectacular! This lively, patriotic show features the All American College Orchestra, Epcot’s Voices of Liberty and the World Dancers. You will also enjoy many patriotic song and dance numbers as well as tributes to the Army, Navy, Air Force, Marines and those who made the ultimate sacrifice for our country. The show concludes with a rousing fireworks finale followed by the Epcot 4th of July perimeter fireworks all around World Showcase. 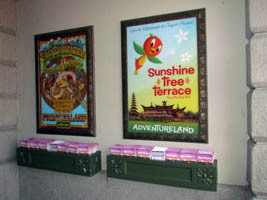 SPECIAL BONUS: The Epcot Center favorite, The American Adventure. Ben Franklin and Mark Twain are your hosts for this E-ticket attraction presenting historic figures who shaped our nation. Audio-Animatronics of Thomas Jefferson, Frederick Douglass, Susan B. Anthony, Will Rogers, Alexander Graham Bell, and Franklin D. Roosevelt are some of the people represented. 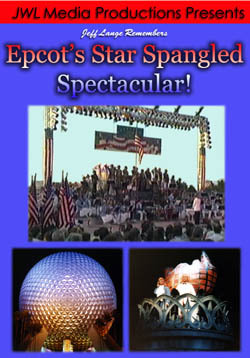 Pick up a copy of Jeff Lange Remembers Epcot’s Star Spangled Spectacular! today and relive all the magic or experience it for the first time. Windsor, Conn. (July 2nd, 2009) – To celebrate Independence Day, we are re-releasing the Jeff Lange Remembers: Epcot’s Star Spangled Holiday Spectacular! DVD.